Providence Homes is excited to announce that The Normandy model home, located at 1801 Duthie Park Court in Crestwood at Durbin Crossing, is now available for sale. 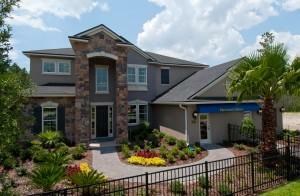 This 100% ENERGY STAR Certified home features 4,308 sq. ft. of living space, with 5 bedrooms and 3.5 baths that offer comfort and flexibility for a variety of families. This award-winning model home features a formal dining room, study, kitchen & café, family room, first floor game room, private loft and a covered patio on a conservation home site. · ENERGY STAR® Certified Home. Ask about our $5,000 guarantee! If you’re interested in living in this incredible model home, call Melissa Meide Matthews at (904) 337-5236 for more details today!